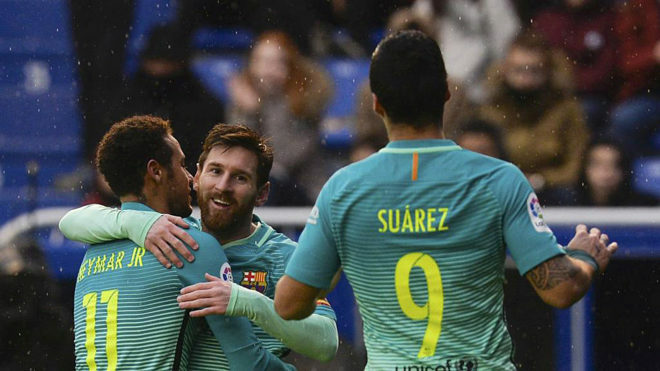 In a battle of the two Copa del Rey finalists, Barcelona hammered Alaves 6-0 on Saturday afternoon at Mendizorrotza in Vitoria to momentarily go top of the La Liga table. The result gives Barcelona a two-point edge over rivals Real Madrid, who are in action later on Saturday and also have an additional match in hand. Nevertheless, it was another sign of intent from the reigning league champions that they will not relinquish their title without a fight. First half goals from Luis Suarez and Neymar gave Barcelona a comfortable lead at half-time, and then the Catalonians put the home side away with a four-goal blitz in eight second-half minutes through Lionel Messi, Ivan Rakitic, Suarez and an Alexis own goal. 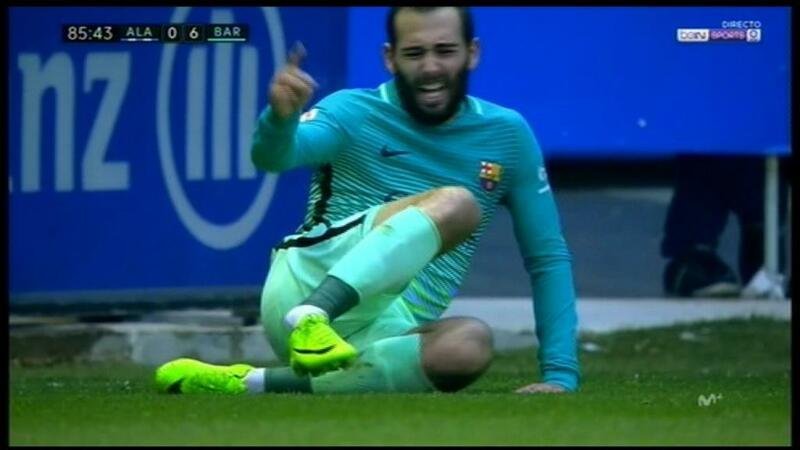 The only downside for Barcelona was a serious ankle injury suffered by Aleix Vidal, who had to be stretchered off in the match’s final minutes. For Barcelona, it was sweet revenge for the 2-1 defeat that Alaves handed them back at the beginning of the season at the Camp Nou in the first match following the September international break. Once Barcelona got rolling, there was no stopping Luis Enrique’s side, whose ruthless finishing made Alaves pay dearly for a slew of mistakes committed by Mauricio Pellegrino’s side. The MSN was back in full force for the Barcelona attack, but the rest of the team had a different look to it. Sergio Busquets made his first start since returning from injury and was flanked by Rakitic and Andre Gomes. In defence, the only carryover from the midweek Copa clash against Atletico Madrid was centre-back Samuel Umtiti. Otherwise, both full-backs, Vidal and Lucas Digne, were new while Jeremy Mathieu slotted in at the other centre-back position. While the Alaves heroes from Wednesday’s Copa semifinal triumph versus Celta – such as Deyverson, Camarasa, Ibai Gomez – did not start, the Basques still looked to go toe-to-toe with Barcelona. The first real chance of the match didn’t come until 15 minutes in when a loose ball in the area fell perfectly for Vidal but the former Sevilla man fired high over the crossbar. Barcelona started to swarm the Alaves area, but suddenly were caught out on an Alaves break that saw Theo Hernandez zip past Digne and bear down on goal. With only Barcelona goalkeeper Marc-Andre ter Stegen to beat, the Alaves defender’s effort was saved by the German stopper, keeping the match scoreless. Luis Enrique’s men looked to reassert their authority on the proceedings by patiently probing and trying to find the space to strike. It would pay off handsomely toward the end of the half with what could be best described as a fantastic team goal. Messi played out wide to Digne, who then slotted a ball back into the middle of the area to Suarez. The Uruguayan touched the ball to Rakitic, who swung out wide right to Vidal, whose laser cross met the charging Suarez and before Alaves goalkeeper Pacheco could react, the ball was in the net for a 1-0 Barcelona lead. If the first Barcelona goal was the product of some superb passing, the second which came minutes later was the result of some good fortune. Messi lofted a ball down to Suarez on the left, however Pacheco got there first and swatted the ball away. 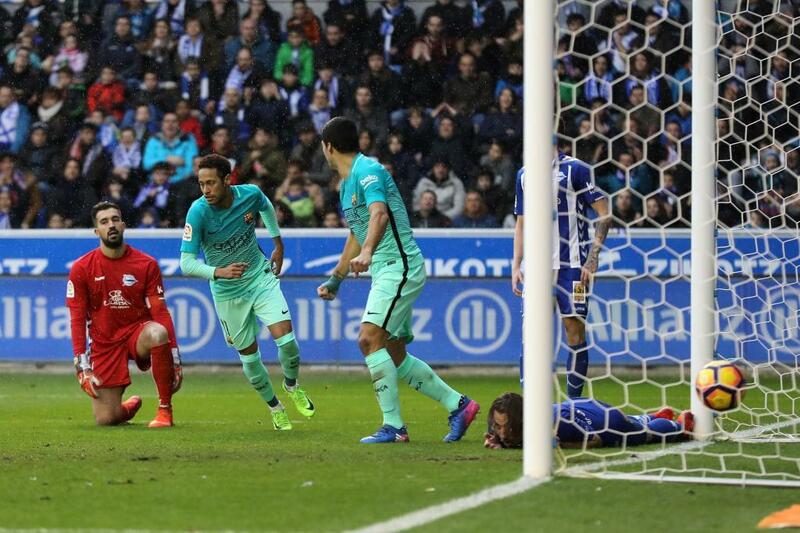 But it deflected off Suarez and fell right to Neymar, who easily swept into the open net to increase the lead to 2-0. Alaves were not about to throw in the towel though and inside the first minute of the second half Santos was presented with a golden opportunity to halve the deficit thanks to Theo Hernandez’s pinpoint cross from the left, but the shot went skyward over the goal. But by the hour mark the hosts’ hopes were all but dashed when Messi struck to make it a 3-0 contest. La Pulga looked to play a quick one-two-combination with Neymar, but the Brazilian was dispossessed by the Alaves defence. Messi took matters into his own hands and took the ball right back off the feet of Vigaray and fired a shot in between Pacheco’s legs for the goal. Yet another error would exact a heavy toll on the Alaves defence minutes later when a Suarez pass into a charging Messi between defenders Theo Hernandez and Alexis saw the ball bounce off the leg of the former and then deflect off the leg of the latter and roll right into goal to make it 4-0. Barcelona weren’t done and a nifty backheel from Suarez – intentional or not – landed perfectly for Rakiutic to send a curling right-footer in past Pacheco for a 5-0 advantage. Suarez would then notch his second goal of the day when Pacheco had to stretch to deflect a Neymar shot from the left, and the Uruguayan happily collected the rebound and rocketed in a shot past the beleaguered home goalkeeper for a 6-0 lead. It should have been a happy final 20 minutes for Barcelona, but that was tainted by an injury to Vidal five minutes from time. The Barcelona right-back collided with Theo Hernandez and had to be stretchered off with an apparent ankle injury, a serious blow to a player who had just begun winning the confidence of Luis Enrique. Barcelona will now turn their thoughts to Tuesday’s Champions League Round of 16 first leg versus Paris Saint-Germain. 0.- Alaves: Pacheco, Vigaray, Alexis, Laguardia, Theo Hernandez (Raul Garcia, min. 88), Marcos Llorente, Daniel Torres, Krsticic (Kiko Femenia, min. 46), Sobrino, Katai, Santos (Oscar Romero, min. 58). Goals: 0-1, min. 37: Suarez; 0-2, min. 40: Neymar; 0-3, min. 59: Messi; 0-4, min. 63: Alexis (og), 0-5, min. 65: Rakitic; 0-6, min. 67: Suarez. Yellow Cards: Umtiti (Min. 6) for Barcelona, Busquets (Min. 59) for Barcelona, Rakitic (Min. 61) for Barcelona, Laguardia (Min. 93) for Alaves.